I didn't really know what it was .. but there, lying lost & forlorn on the pile of garden rubbish at the tip, it was! 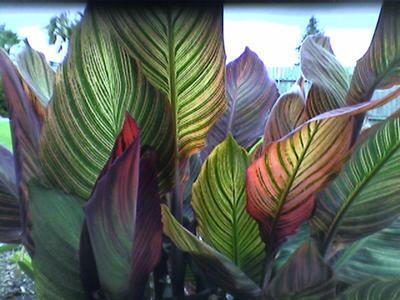 A large & brightly variegated Burgundy/Red/Bronze & Green leaf! I couldn't help myself .. pulling at this wonder, I discovered it was attached to more of a plant stem & then a clump of dirt with roots! WOW! I can grow this, whatever it turns out to be! You guessed it; it was a piece of Tropicanna Canna! It grew here in the Northern Tablelands of NSW like it was 'home' & I soon had a gorgeous 2 metre tall plant, right next to my dog's run & plenty to sub-divide. I moved a few later to the NSW mid-Nth coast & took it with me, using it to screen along a low back area of the house from neighbours .. this photo was taken with my phone .. the only 'camera' I had at the time! Now living back in the NSW Nth Tablelands, I have around 20 different Cannas .. and an obsession of course!